DevOps is a culture adopted in an organisation, which embodies a set of practices, tools and philosophies that gives an organization the ability to develop and deliver apps and services at a rapid pace. An Organization that adopts DevOps, can deliver an app at speeds much faster than organizations adopting the older and traditional forms of software development and infrastructure management. How does DevOps work in an organization? In the traditional model, development and operations teams are siloed. They rarely interacted in a meaningful way. Due to the lack of interaction, when an app was released, the chances of it crashing were much higher. A bigger headache was to rectify the bug in the shortest possible time. This resulted in a whole bunch of furious customers, who had to wait a long time for the glitch to be resolved. 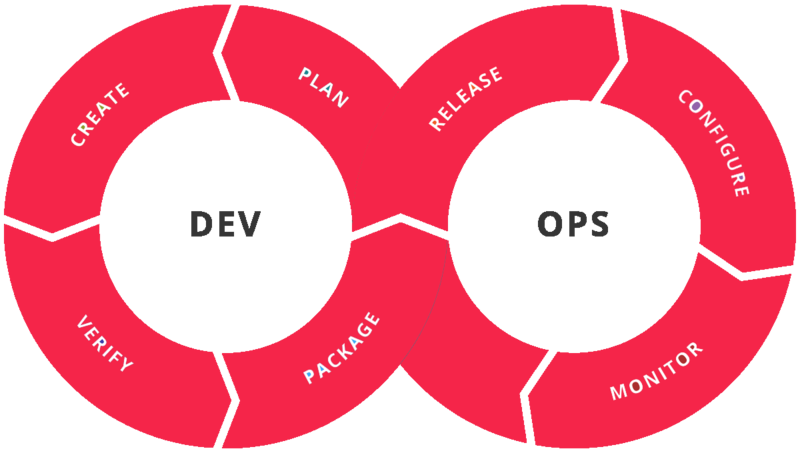 When DevOps is applied, the development and operations teams are not separated by silos, but rather, they are merged into a single team across the entire development and deployment cycle. Since all team members work as a cohesive unit, the chances of bugs in the apps are greatly reduced. Even if a bug appears at launch, the team, working as a whole, can detect the problem and rectify it within the shortest possible time. What are the benefits of introducing DevOps? •Speed – DevOps helps an Organization to innovate apps at a faster pace. It also helps them to launch the product without experiencing any major glitches. The efficiency that DevOps brings helps the business to adapt to changing market trends in real time. It also gives the customer a better experience when dealing with the organization. •	Rapid Delivery of new Products – DevOps helps speed up the process of innovation, development and launch of new apps. It reduces the time required to iron out any bugs etc. It helps in responding faster to customer needs and market trends. •	Reliability – In the DevOps model, since development and operational teams work together, the quality of app updates and/or infrastructure changes are of a much higher standard. The new app can also be delivered faster, with greater reliability. • Scale – The entire business ecosystem can be scaled up easily when DevOps is in place. By using automation and consistency, complex and dynamic systems can be managed efficiently, but with reduced risk. • Collaboration between teams – In the DevOps cultural model, the development and operations teams are in close partnership. They share many responsibilities and their workflows are merged. It increases the efficiency of the teams and leads to less time between development and launch. •	The next disruptive technology in the IT field will be the software automation. When you get DevOps training in Chennai, you will be correctly positioned to take advantage of numerous placement prospects on offer. You can expect a highly rewarding career, not only monetarily, but also with job satisfaction. •	Security – In the DevOps model, the entire team moves forward at a faster pace, but at the same time retaining control and preserving compliance. By using automated compliance policies of controls and configuration, security need not be sacrificed. Even though the workload is tackled at a faster pace, there is no compromise on the security front. With more and more organizations adopting DevOps, jobs in this field have multiplied manifold. An IT Professional with proper training can land a well paid job without much effort. For this proper DevOps training and thorough knowledge is needed. Why DevOps training with us? We are a multi-faceted IT Training Institute with a reputation of excellence in the field of IT training. We believe that DevOps and all the other courses we offer, should be the best available to an aspiring student. Our Trainers are well experienced, both in Industry as well as training. They have put together a course DevOps Certification Training Course, which takes a student through a step by step process from the foundation to finish. This step by step module ensures that all students get a thorough DevOps training. Our Trainers also mentor all students on an individual basis, to ensure that they are getting the best out of the training modules. Students are encourages to interact with the Trainers, as well as with each other, so that what they have learned gets reinforced. For such a detailed and thorough training, we believe in charging only moderate and affordable fees. We have structured our time table in a flexible manner so as to suit the needs of most students. Since DevOps has taken the IT world by storm, more and more Organizations are adopting this ecosystem. Lots of jobs are available to those aspiring to become IT Professionals in DevOps. Proper training is essential and for this it makes sense to join our DevOps training course. The DevOps training programme of our Institute is regarded as one of the top DevOps training courses. Once a student completes our DevOps training certification course, he/she will feel confident to literally walk into a high paying job with job satisfaction too. The DevOps training we provide is all inclusive and covers every aspect of DevOps. What makes JPM Edu Solutions the best DevOps training Institute in Chennai? Our Institute, JPM Edu Solutions is regarded as one of the best in Chennai. This reputation did not come to us overnight. It took a lot of hard work. To training students properly, we designed courses which maximised the potential and knowledge of a student in the course he/she is undergoing. Once a student undergoes training in DevOps from us, he will be thoroughly knowledgeable in the topic. This reputation has been enhanced over the years by word of mouth as well as by our best ambassadors – OUR STUDENTS, who are working in some of the best IT Majors. When you opt for a course in DevOps training in Chennai, make sure you undergo the training in our Institute, which by far, is the best DevOps training Institute in Chennai. If you have any queries about undergoing DevOps training Courses in Chennai, please do not hesitate to contact us at [email protected] or call +91 7550194475 We are here to help you launch your career.